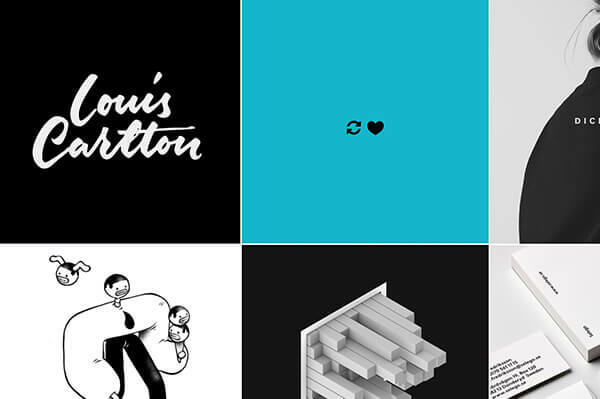 The perfect way to brand your creative agency portfolio on Tumblr. 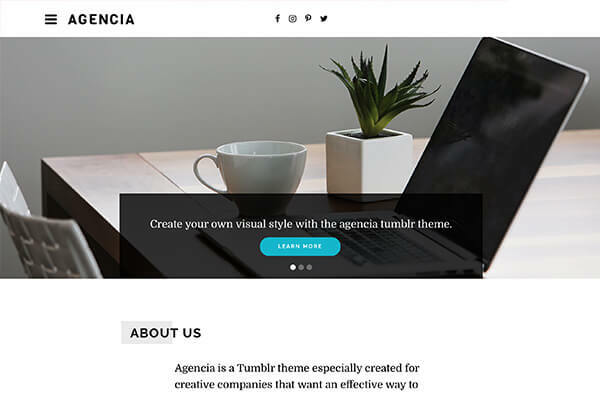 A beautiful Tumblr theme for creative agencies and freelancers, to make your work and personality shine. 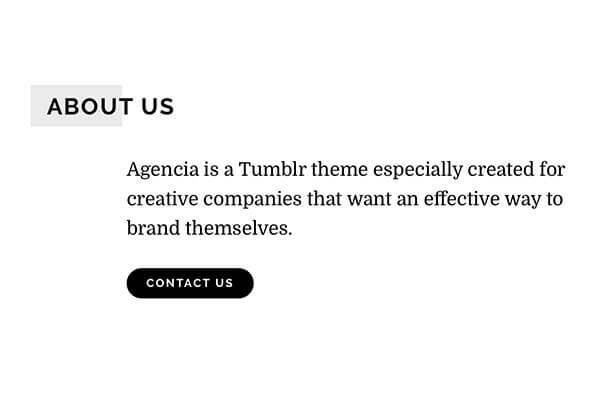 Themelantic is proud to present Agencia — a stylish Tumblr theme for creatives. 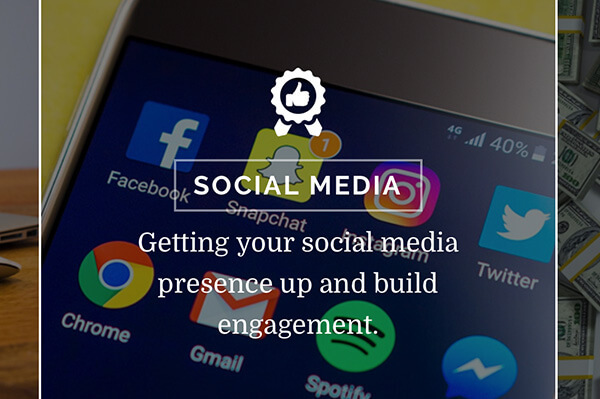 Feature your latest work, services, social media posts, and testimonials. All wrapped up in a beautiful, customisable design! Use a slider at the top of your site to feature your latest work, photos of your company/office/team, or anything else you’d like to highlight. Each slide can have a description, button, and link attached. 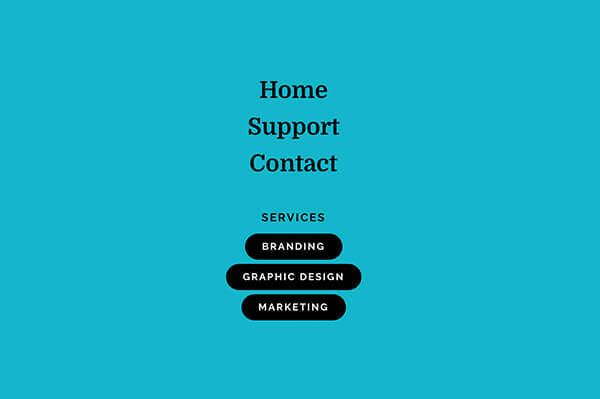 It’s a great way to quickly point people to your key pages, posts, or services. Three blocks on the homepage give you space to feature the key services or products that you offer. Each can have an icon, title, and description (and they can link off to a page or URL of your choice). The perfect way to introduce exactly what your agency is able to offer. Not interested in this? You can turn it off with a click. Feature some information about your company/agency (or yourself, if you’re a freelancer) on your homepage. A great way to introduce your core message, or company slogan. Also use this opportunity to link to a contact page, or a page that features a larger profile of your company. 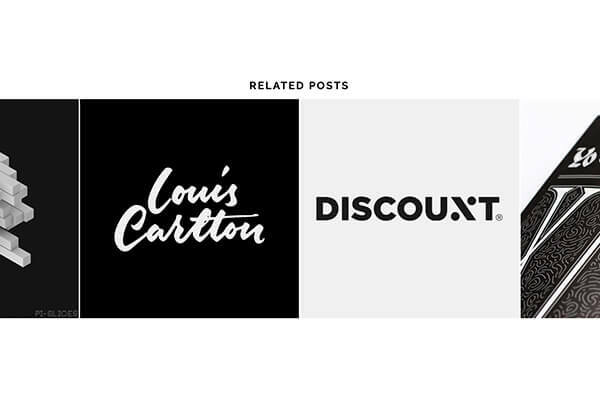 Posts are arranged in a grid style, with a custom design for each different type of post. Whether you’re mainly sharing photos, videos, quotes, or questions, your content will look stunning. 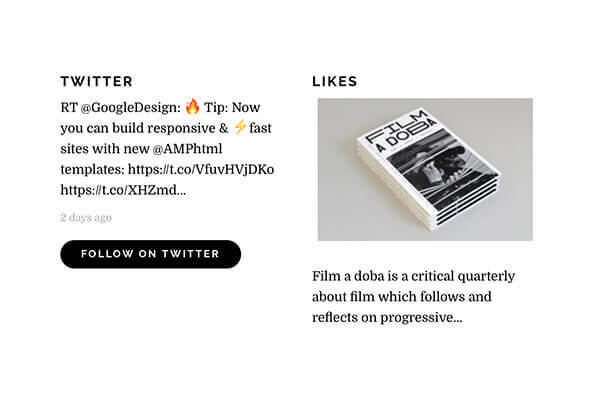 It’s simple for readers to like, reblog, or link to your posts, with icons underneath each post. 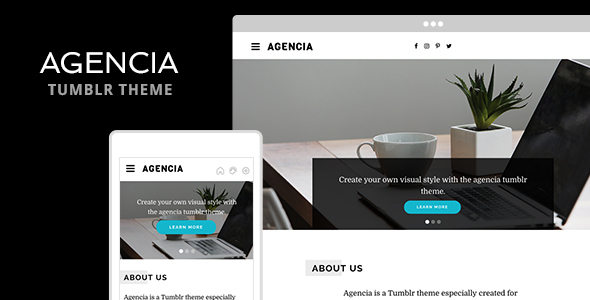 Agencia has a full-page menu at the top of each page, making it easy for people to find different pages on your Tumblr blog, or search through your posts and photos. You can also enter a selection of tags to make it easier for people to navigate through your portfolio. 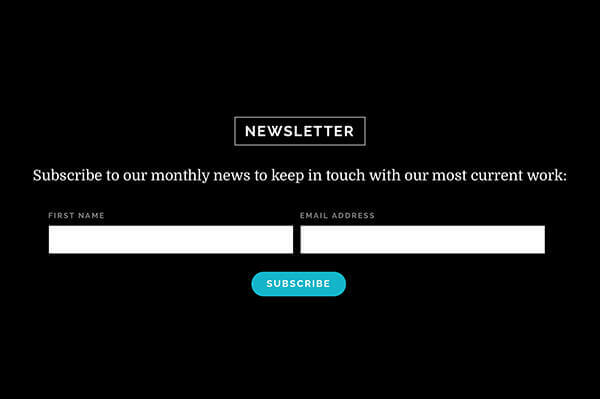 Agencia integrates easily with MailChimp, to show a “newsletter subscribe” box at the bottom of your site. It makes it easy for visitors to enter their email address and join your newsletter. A perfect way to build up a contact list of new potential customers! Agencia supports widgets for showing your photos and designs from other places — Instagram, Dribbble, or Flickr, or thoughts and links from Twitter. You open these with the “exposure” icon in the title bar. With one click, visitors can share your content across different social channels: Twitter, Facebook, Email, and Embed. 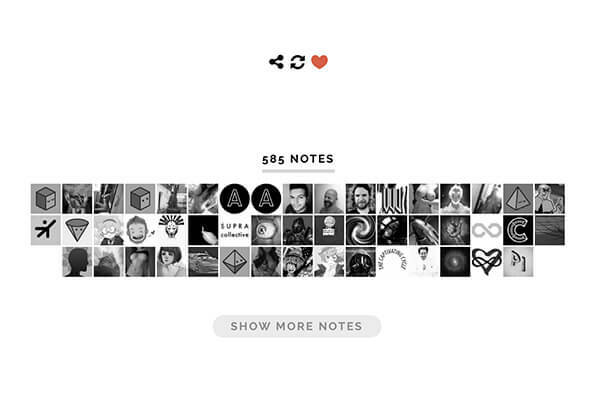 This is in addition to all the usual Tumblr features, allowing people to like and reblog your portfolio of work. Don’t let your incredible content go unnoticed! You can also feature the other Tumblr blogs you follow in the sidebar, and posts that you’ve liked from other blogs and locations. A great way to share the love! 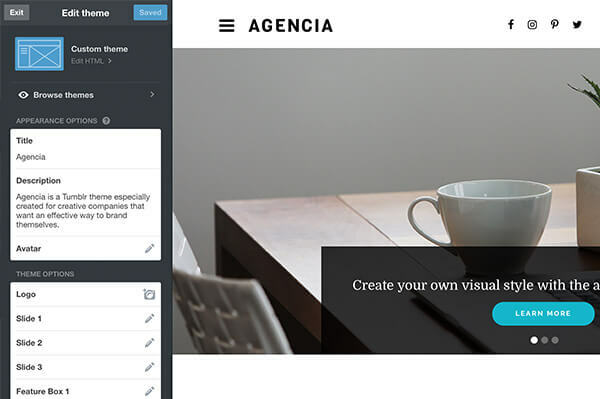 Agencia automatically finds related posts to show after your content, to keep people browsing around your portfolio or blog. A great way to surface relevant content for your visitors. Responsive and Retina Ready – This theme will work great in all platform sizes and definitions. It’s modern and prepared to work in modern browsers. Customizable Color Scheme – All main colors can be changed using the customizer. 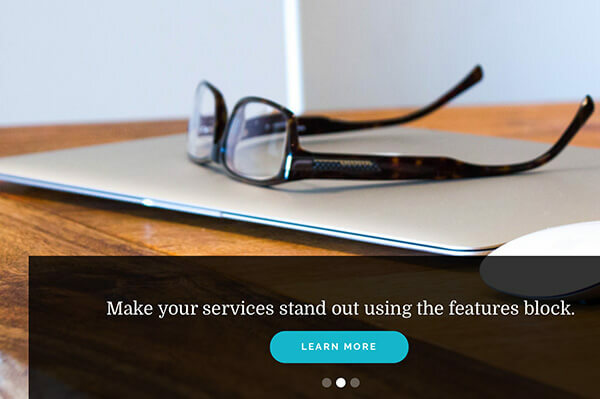 Slider – The homepage can have a slider with up to 3 slides. Photoset Grid – Photosets will retain the custom layout and each image can be expanded using a lightbox effect. 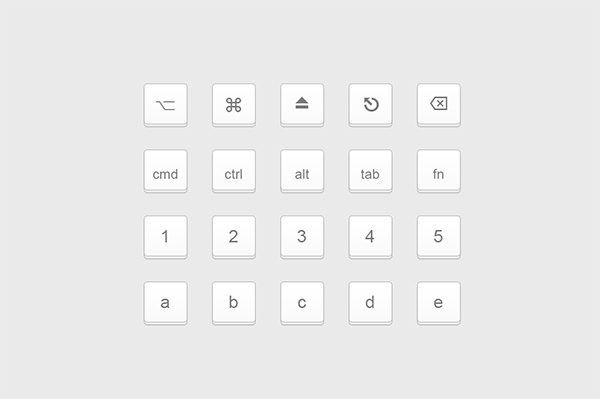 Keyboard Navigation – You can use the Right and Left keys on your keyboard to navigate between blog posts. Use H for home and R for random. Social Sharing – Posts can be shared to Facebook / Twitter / Pinterest. Widgetized Footer – This theme can take multiple widgets: About / Twitter / Flickr / Dribbble and they will appear in footer. Submenu with Configurable Tags – Allows the main navigation to have a submenu that is made of tags and will categorize the content of the site. Social Media Icons – You can add up to 12 social icons with links to your profiles. Google Fonts – You can choose whatever font you’d like from a library of hundreds of free and optimized for the web fonts. Disqus Compatible - You can add Disqus comments to your blog, just add your username. Google Analytics Ready – Just add the code and it’s set. SEO Ready – All SEO principles available to Tumblr themes were taken into account in this theme. Expandable – It also features an header and footer HTML code fields for you to add your own code. Fully Documented – All of the theme options are fully documented in a PDF file and also available online in the demo site.